Countless individuals, governments, organizations, and businesses are coming to recognize the importance creating an environmentally sustainable or “green” society, and the shredding industry is no different. 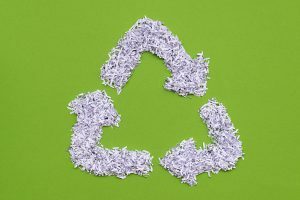 One of the fundamental components to sustainable shredding includes recycling, which allows used shredded paper to be reused for other paper products like paper towels, napkins, or new paper itself. Today many providers have already adopted sustainable shredding practices and now offer environmentally-friendly services, but not only because it’s the right thing to do—it also helps to further destroy any sensitive information remaining on the documents they shred. 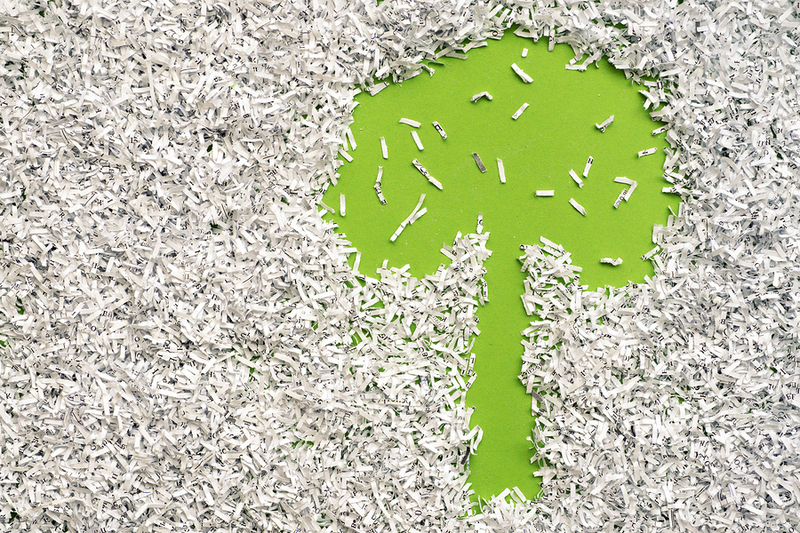 What Makes Paper Shredding Sustainable? The Greek root of the word recycle is “cycl”, meaning circle, and when it comes to the recycling process and sustainable shredding, circle can have a quite literal meaning. Rather than beginning at a piece of paper’s production and ending at the time of its final disposal, recycling post-shredding instead creates a circular lifespan where there truly is no beginning or end of a piece of paper’s period of use. With this process, once paper is ready for disposal it’s shredded, recycled, and sustainably reused rather than going to a landfill—in this way completing the paper “circle of life” without missing any critical steps like removing sensitive personal and proprietary information along the way. Throughout this in-depth white paper, we provide a breakdown of what it means to have your paper waste sustainably shredded—taking a closer look at both the sustainable paper shredding and recycling process, as well as what makes paper shredding an environmentally-friendly service. The fundamental idea behind recycling and sustainability is the process of creating new paper products from already used paper, and luckily, in the shredding industry there is no shortage of paper. But where does paper shredding come into play with a sustainable recycling process? 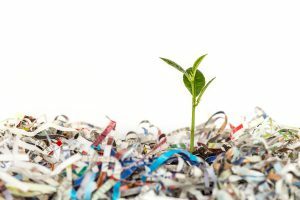 While some may not even realize, many shredding providers have implemented recycling processes after shredding out of recognition for environmental sustainability. The benefit of these sustainable services is not only a boost to business reputations by adopting green paper disposal practices—the recycling process can also work to ensure the security of the sensitive information businesses and individuals are having shredded. Nearly all of Shred Nations’ partners implement “green” shredding processes and business practices—recycling their shredded materials so they can be reused later. To begin the process, documents are collected and shredded using either mobile shredding, offsite shredding, or drop off shredding. Afterwards, the shredded paper is placed in a vat where a mixture of chemicals separates any ink from the paper itself. With the paper now broken down to basic and reusable components, it’s then mixed with water to make a pulp before being washed, refined, and prepared to begin the papermaking process anew. The beauty of this shredded paper recycling process is that all necessary paper fibers can be recovered from the countless pounds of paper thrown away each day, rather than using fresh resources. By the time the process is finished, the recycled paper can be sustainably reused to manufacture paper products such as paper napkins, plates, or new paper. Recycling offers businesses and individuals a dual advantage—providing the peace of mind they’re doing the environmentally right thing, but with all the same assurance their sensitive personal or proprietary information has been safely shredded and destroyed. Many modern organizations and companies have founded themselves on the basis of recycling and a “green” paper disposal process, and yet, today discarded paper in normal trash cans still unfortunately represents 26 million tons (16%) of all landfill waste. Contrary to this assumption, however, according to environmental data from The World Counts on paper use, waste, and recycling, discarded paper and paper pulp is actually the third largest polluter of air, soil, and water. Rather than harmlessly decomposing as one might believe, rotting paper emits methane gas—fumes which are 25 times more toxic to the environment than CO2 gases. By shredding and recycling this paper on the other hand, businesses and individuals can reduce greenhouse gas emissions from thrown away paper now in landfills—instead taking this paper which would otherwise be harmfully disposed to be reused for new paper and paper products. Dumpster divers have long made recycling papers with personal or proprietary information potentially risky because of the potential for identity theft or fraud, and can lead to costly and time-consuming privacy and security issues if documents are not safely destroyed before they’re disposed. To counter security threats, paper shredding is often the first recommendation for protecting sensitive documents, and luckily, our shredding services work to make this process a greener way of handling and disposing paper too. Many of our shredding providers offer recycling as an included part of their services—using environmentally-friendly practices to sustainably provide the shredding services needed by individuals and businesses to maintain security throughout a document’s lifetime. Printing a New York Times Sunday edition requires 75,000 trees. Individuals in America consume more than 700 pounds of paper every year per person. Compounding this, offices in the United States use approximately 12.1 trillion sheets of paper every year. Of these, 45% of the paper used in offices is trashed instead of recycled according to The Paperless Project. Today, paper represents 26 million tons (16%) of all landfill waste, now rotting and emitting toxic methane gas into the atmosphere. By recycling and reusing 1 ton of paper on the other hand, 17 fully-matured trees, 26,500 liters of water, and 680 gallons of oil can be saved. Per ton, using recycled paper to manufacture new paper products can cut energy consumption by 65%, water consumption by 58%, and eliminate as much as 60 lbs of air pollutant emissions. Recycling is an excellent way for businesses and individuals alike to do their part in creating an environmentally sustainable society, but it’s important you’re also considering the security of the documents you recycle. With sustainable shredding on the other hand, two birds are taken care of with one stone, as the paper is also securely transported and shredded before recycling, whereas with a normal recycling plant, there are no assurances of the privacy and security document shredding services can provide. How Do You Handle Recycling Security? If you’re having paper waste recycled instead of hauled off with the normal trash, you’re at least doing your part to create a greener world, but have you ensured any sensitive information you’re recycling is secure? To balance both sustainability with security, consider shredding and recycling services to safeguard against identity theft or fraud. 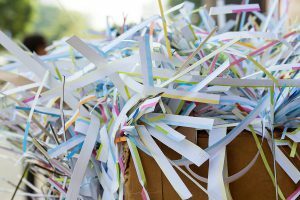 Do Shredding Service Providers Recycle the Documents They Shred? Keeping pace not only with other major industries but the rest of the larger global community as well, many of Shred Nations’ shredding partners have made strides to incorporate sustainable business practices into their everyday shredding—working to provide both a convenient and environmentally-friendly alternative for paper disposal. 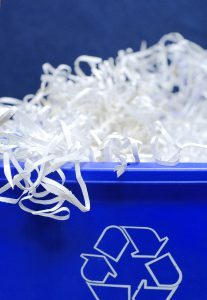 There’s no disputing the economic and environmental benefits to green document destruction processes, and with the the help of sustainable shredding services, homes and businesses are able to sidestep the inconvenience of personal shredders while still ensuring their documents can be recycled and reused. At Shred Nations, we partner with a nationwide network of the top providers in sustainable shredding, with services ranging from mobile and offsite services powered by low fuel consumption and emission trucks, to drop off locations with recycling as an included part of their services. To learn more about environmentally sustainable shredding practices or to get a free estimate, just give us a call at (800) 747-3365, or simply fill out the form at the right side of your screen to get free quotes on sustainable shredding services in your area. 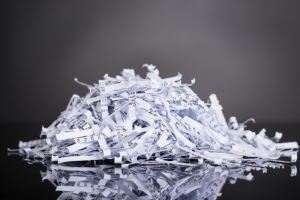 When it comes to document shredding, it may be hard to initially believe how an industry built on document destruction would do anything but create paper waste. But when taking a closer look, one can see how recycling processes post-shredding are working to create a sustainable cycle for shredded paper bits to be reused for new products time and time again. Most people have heard about recycling and how it benefits our environment—but how many know the difference between just recycling, and secure recycling? Rather than throwing papers whole into a recycling bin, ensure the sensitive information you’re disposing is protected with the help of secure shredding and recycling services. Papers, documents, and records in a variety of formats play a huge role in both work and home life, and while the paper shredding industry is stepping up with greener business practices, document scanning and record storage services still have plenty to offer. Learn more about how scanning and storage helps to create a more sustainable environment with its complements to shredding along with its own contributions as well.